As tech startups start to disrupt markets where enterprises ruled for decades, the need for innovation becomes bigger. Some turn to me and ask; “-Can you help us do lean customer development.” “-Can you help us think more visually.” “-Can you help us be more like a lean startup.” “-Can you help us be more innovative.” And although that first realization, by at least the one person that asks, that somethings need to change is a good start. It is no where enough for that company to stay on top. So what is needed to change, to be innovative and creative. Is your company ready for it? 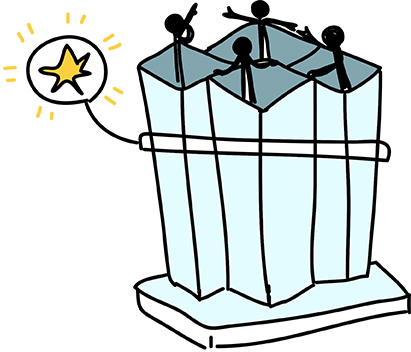 Most companies still operate with highly hierarchical vertical silos and have a solid bonus structure in place. All of which enhances? vertical rather than out of the box thinking and suppresses intrapreneurial thinking. The active bonus structures in place rewards us for not sticking our neck out to not think about the company as a whole, to not improve things or think cross verticals. The hierarchy accompanying this makes sure that intrapreneurial ideas or efforts do not make it past the first node in the system. In order to really tap into the creativity and knowledge of your employees, to nurture innovation and spark ideas, your company needs to change from within. Your internal culture, the way people are rewarded, and the way people can interact with others within the company is of critical importance. A change toward a company where efforts are rewarded and failure is not necessarily a bad thing. Where cross company thinking will spark new ideas and improvements, where autonomous teams can experiment on new products the way startups do. Now this is not something to be done overnight, you cannot change internal culture by writing a document with a few buzz words and values and send it around. It is something that every single person in a company needs to feel. From management to receptionist, from janitor to salesperson. You are all in it together, for the greater good. Culture change is a process that involves every single member of your company. It is the little steps that start making a difference toward the shift. The cross division social hub that was needed to stay on top of the social communication, the cross division innovation hub created to initiate more innovation, those are the first steps of change. Cross division, with certain authority and a clear understanding within what boundaries they are able to call their own shots. It is from within these hubs that the requests for help usually come, so in my opinion, even if they ask for just that one tiny element that is part of a whole, one small step in the process towards change, I will help them wholeheartedly. With that one little step if needed, with a bigger one if possible, because every understanding of a shift in perception, through visual thinking, through lean customer development, through thinking in a different mindset, will help the company in its shift. Innovation walks on two legs, we need people to fuel the change, person to person, step by step. So enterprises? are you ready to innovate big? Start from within, empower your employees, step by step.